And I'm sure you'll come to the same conclusion after playing TNCTF40 after a while. Very rarely do we find a map which follows the same ol' 2Forts design and is still fun. TNCTF40 is an exception. It's fun, plays great, and looks good. 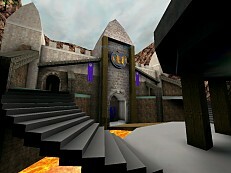 I was immediately impressed by the architecture in TNCTF40, it was different, but somehow felt like many Epic maps I've played. Simple, yet impressive. There's no fancy curved architecture here, but it still manages to catch your eye. The layout is also imprssive. The setting is two forts/castles with lava moats facing each other, and one large barrier between them. There's several entrances into both forts, sniper positions on the battlements, and multiple ways of getting ot every area, even the flag room. One other thing that impressed me was the flow. This level flows very smoothly, looping back on itself, providing multiple routes of getting back to the same area, and most importantly, you don't notice it! Moreso, the layout is unobtrusive and doesn't hinder gameplay at all. Things flow very well. So the playability factor on this map is extremely high. Bots definitely know their way around this map. This is a nice surprise after reviewing several crappy DM's with no pathnoding whatsoever. You'll have no problem sending your teammates off to cap the flag and feeling confident that they'll return rather than get stuck someplace. The only problem I could find in this map is the ambient sound for the lava is much too loud, and possibly the inclusion of a redeemer is pointless, since it's not used much (at least, not with bots). What are you still doing reading this review? Go download this map now! It's pure gold. This map ROX.This is one of The BestUT maps i've ever played.Its the best.I've neveer seen a map this smooth and good.The bots when u put your gameplay on Experienced it's like Adept.That's how good the bots play.DOWNLOAD IT NOW!DOWNLOAD IT NOW!DOWNLOAD IT NOW!DOWNLOAD IT NOW! Too short, not enough room for maneuvering.